This past week went fine–a busy work week, relaxing evenings, injections at 10pm. My friend C asked me on the phone last night if I was feeling anything yet and I said I didn’t think so–a little more tired, maybe, but that was it. Today I started to feel it. I woke up around 7am and cleaned my kitchen from top to bottom, including every cupboard and inside the refrigerator (super abnormal behavior). I made myself breakfast and soon after started feeling sick to my stomach. I sat down on the couch and felt overwhelmingly tired. I wondered if I’d feel well enough to hike with my sister. Then it started to rain. And the tears started to fall. I know that it was the hormones because I wasn’t crying about anything. There was no trigger, nothing in particular on my mind. I just looked out at the rainy streets and cried, and then, as long as I was crying, I cried about having to put my body through this, and about not knowing what’s next, and what if it only gets worse, and it will because I’m only 6 days into Lupron and the big guns come out in about a week. My sister texted that she was on her way over, and I pulled it together and showered and got ready. As soon as she got here, I felt better. We planned an urban hike. Even though rain was forecast through the entire weekend, it really only rained for about 10 minutes this morning and then transformed into a glorious, warm, sunny day with only the mildest of breezes. We walked to the new Bi-Rite on Divis to get sandwiches, oranges, popcorn, and kombucha, and went over to the Panhandle and then to the tippy top of Buena Vista Park. I noticed the beauty all around–the plum and cherry blossoms, the daffodils, a blue jay. The erratic streaks of clouds across the blue sky as our storm apparently sideswiped us. I felt relaxed because I had nothing to do later, nothing to check, nothing to get done. We came back to my apartment and watched The Hunger Games, which I read last summer and she just finished..another good distraction (and better than I expected). She went to have dinner with a friend while I stayed in and ate homemade black bean chili and cornbread. I did a little googling of Lupron side effects and found that pretty much anything goes; the lists are long. The drug originated as a treatment for prostate cancer. We’re playing with the pituitary gland which seems like the epicenter of hormones, so it kinda makes sense that things could get a little nutty. But not totally–I feel fine right now and had an awesome day. I just think I expected to have no side effects–I even wrote that in my last post–much like me and Ms. R. thought we’d (obviously) get prego on the first try. I’d call it naïveté, or maybe even willful ignorance, or false confidence–it doesn’t always work out the way you expected. So true. And calling it a ride kind of makes it sound more fun, like an adventure. What will happen next? Stay tuned! I just signed up for 3 upcoming events and wanted to let any friends in on it who may want to join me. On Sat. 6/1, a daylong called Nature as Teacher–A Daylong in Nature. I’ve done this before–a lovely full day of outdoor meditation and dharma talks. As I told my sister today, at the beginning of June I’ll be in “some kind of state of mind…” so a couple of daylongs will be well-timed. And, finally, I would like to announce my first Blog Giveaway in honor of the upcoming first anniversary of The Solo Mama Project. I have two tickets to see Annie Lamott and her son Sam do a reading at St. Andrew’s Presbyterian Church in Marin City on Wed, 4/17 at 8pm. Email me if you want to go with me–first friend to contact me gets to come with. One of my favorite authors, in the very church about which she frequently writes, and one of the original voices of a single mom by choice. It’s a benefit for St. Andrew’s. I only heard about it because Annie herself posted it on facebook and I follow her. Excited! Don’t cry for me, Argentina! My sister says I’m rockin’ this. Has it really been 6 days since I last posted? It flew. I had one last 24-hr work trip and that wraps up my air travel in the foreseeable future. Can I even explain how much I love love love to be home? Every time my plane lands at SFO, my heart just swells even more with love and pride for my city. I am home. What a blessing. I am on my 3rd night of injecting Lupron, no bigs. I can’t say it doesn’t hurt, but it’s quick. This part is designed to quiet down my ovaries, to give them a good rest and create a perfectly blank canvas on which to paint a bazillion new follicles in the next cycle. I don’t know what the side effects are of Lupron (which I think is a good thing) but I think they will be minimal while my ovaries go on a silent retreat. This regimen will continue until Saturday when I stop taking the birth control pills, continue Lupron, and go for the baseline ultrasound next week. That’s the blank canvas appointment (hopefully). This week is so much calmer than last week without daily appointments and giant decisions. This part feels easy. I feel kind of robotic too, less emotional. Following directions. My friend who was on the same exact pregnancy timeline as me before I miscarried just had her baby. I thought it would or could hit me hard…but it didn’t. I just feel like it wasn’t my time, my time is still ahead. I’m happy for them, excited to meet the baby. You never know how you’re going to feel. I have 110% turned off my love life, online profiles deleted. It feels almost unnatural since I have never entirely closed that door, but my therapist and I came up with a good term for this: my dating life is “dormant.” It’s obviously a good time to shut it down. There is a peace in it, but also an invisibleness. Hey, cute guy next to me at the salsa bar putting salsa in tiny cups with giant ladles, can you even see me right now?. Sigh! That’s my alarm going off reminding me to inject and go to bed. After my last post, my IVF veteran friends called one by one, sharing their experiences. I realized I was still swimming in uncertainty about Day 3 vs. Day 5 and genetic testing. Then I talked to Dr. B, my friend who is pregnant after 2 IVFs–first time she did a Day 3 transfer and it didn’t work. Second time: genetic testing and a frozen embryo transfer a month later–worked. She also reminded me of a woman we know from the national boards who, like me, got pregnant easily and had early losses. She got tons of eggs, and 6 embryos made it to Day 5. After testing, they found that only one was normal. And that’s the one she’s pregnant with now! They can’t eyeball these things… And at my age, 2/3 of my eggs aren’t going to work. I realized that putting 3-4 embies in on Day 3 would feel like “spray and pray.” And why not find out which ones have the right chromosome count when the technology is there? And mitigate the risk of miscarriage? They only want to put back one to ensure that this blog doesn’t turn into solo mama with twins (as if I could keep blogging!). The risks are: losing a normal one between Days 3 and 5 (impossible to know if this happens or not), ending up with all abnormal, or ending up with nothing. I sat with it, did a pro/con list. I have to say, the pro/con list never fails me when it comes to big decisions. What rose to the top as the favorite pro? Peace of mind. Today I met with the genetic counselor along with a doctor who was observing. We were all women around the same age. I learned so much nerdy science stuff that I can’t adequately convey while typing on the iPad. Let’s just say that the technology is mind blowing. Particularly the part where they map the genetics of me and McPiercy and it’s where the code veers from either of ours that they determine it’s abnormal. That and missing or extra chromosomes. I emailed Dr. T because he gave me his card and said I could. I apologized for changing my mind but apparently needed more time and now I’m clear. All he had done was “order the labs” so I think all he had to do was revise the order. He wrote back, “No Problem, K” and I liked how he capitalized No Problem. He acknowledged that it’s a very difficult decision and copied in Olga and Lili (the genetic counselor), so now we’re all on the same page. So, sports fans, I just added a month to the final result. The biopsies, a few cells from the part of each embie that will become the placenta gets couriered down to San Carlos where the results take two weeks. So I’ll catch the next cycle and transfer in early May. After a little R&R and detox from all those drugs you see on my dining room table. My baby will be born in 2014. Good night, friends. 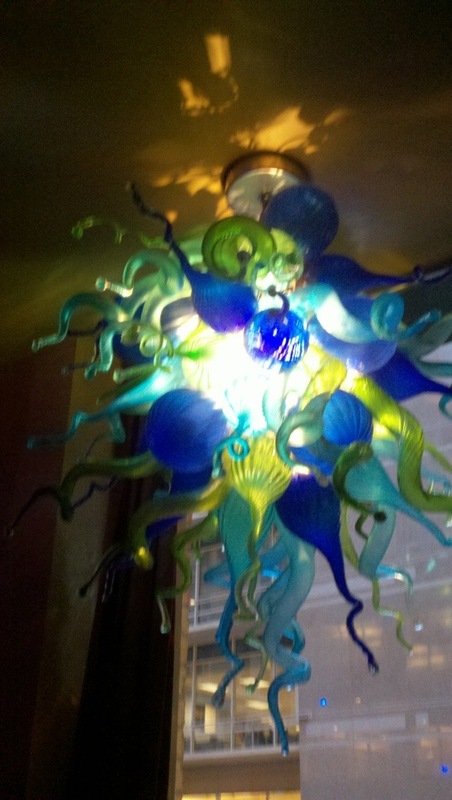 I leave you with this light fixture in the restaurant where I had dinner tonight with my friend C. Am I hallucinating or do you see it too? 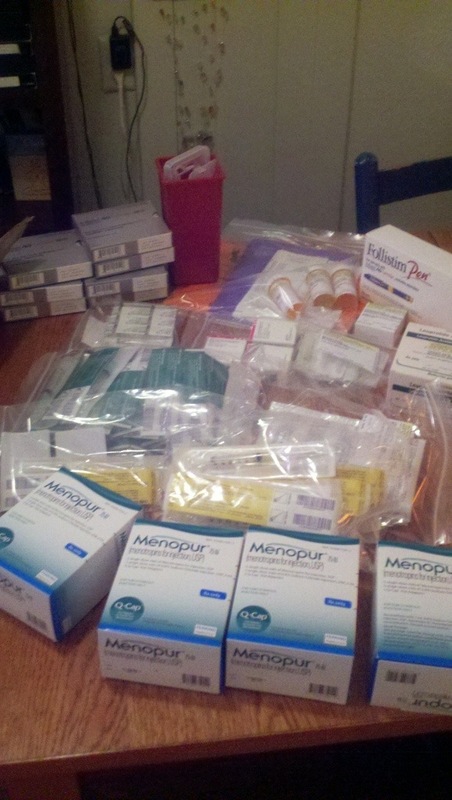 I’ve begun my IVF protocol, without a break, careening straight into a full calendar and a giant box of meds. It is so huge. I hope I can adequately convey to you how big this is. It was a good time to take a break from the blog considering this monumental transition and the fact that I had no bandwidth for writing (or even thinking) while traveling and working and spending time with family and processing the neg bomb. I have not even close to sufficiently responded to all the love that poured in after my last post. I needed an escape, I took a break from everything, including you. But not including work–it’s my busiest time of year. I spent time in therapy talking through the way I channel a lot of my anxiety about fertility into my job, trying to stay on top of it, trying to control it. But while my job is a priority, it is not THE priority. I am myopically focused on the priority. The intensity of it is awesome in the old-fashioned sense of the word. IVF began in Indianapolis, when I emailed Olga to give the green light on this cycle. Yes, it was short notice to get all of our ducks in a row but her next email bowled me over: you need to go to IVF orientation, sign a consent form in person, attend an injection class, have a saline sonogram, do a test transfer, meet with Dr. Tran, meet with a genetic counselor, order your meds, start birth control pills, start antibiotics, have a financial consult, and clear your schedule. Next, I called the pharmacy and got bowled over again: Lupron, Gonal-F, Menopur, Methylpredisolone (I actually don’t even know what this one is), Progesterone, Estrace, more syringes than I want to count, 3 different gauges of needles, and 10mg of Valium. I could have used the Valium at the top of this paragraph. Are you feeling overwhelmed? Because if not, you did not read carefully. This is Mount Everest. I have mountains of compassion for all women who have gone through this and I have only just started. Having a full life and then taking on IVF is like a second full-time job. And I have only just begun–what’s going to happen to my body, my finances, my mind?? And, the biggest question of all: will it work? I am about a week into birth control and started the antibiotics last night (coincidentally I have a cold and maybe it will help with that). I attended injection class, along with 2 straight couples, a lesbian couple, and a couple of single women freezing their eggs–very educational. I learned that triplets are rare (maybe 4x/yr at UCSF) and cause for many staff meetings where they discuss “where did we go wrong?? ?” Not your every day occurrence. I paid attention during Gonal-F but zoned out during Follistim, then got an email from Olga that I’ll be switching to Follistim because Gonal-F isn’t covered on my insurance (my reaction: yay, medication covered on my insurance! but damn–should have paid more attention during the Follistim presentation). Had my saline sonogram and mock transfer yesterday, thankfully not at all painful (I had visions of the HSG test and hives)–Dr. Renato said the transfer will be really easy and none of my fibroids are in the cavity: cleared to go forward. Today, I met with Dr. Tran. As I have mentioned, I love him (as in IN love with him). Today he was in a tie and white coat, his coffee from Peet’s. He is masterful at drawing upside down. I had more or less decided to go with PGS (genetic testing on Day 5) and then had second thoughts when weighing out the cost and the risks. You can either: transfer 3-4 embryos on Day 3 and freeze the rest at that point or let them go to Day 5, lose 60%, genetically test them, freeze them, and later on put back the 1-2 normal ones (for an additional $7k on top of approx $12k). There are huge pros and cons on both sides and no guarantees for any of it, so it’s very complicated and gave me visions of gambling in Reno.. At this point, and on his recommendation, I am hedging my bets–opting for Day 3 in an effort to have a fresh transfer, enough leftover to freeze, and at least a little money left in case I have to do it all again. Higher risk of miscarriage which is terrifying. But I feel like there’s safety in numbers… I’m meeting with a genetic counselor tomorrow just to be informed. And I start Lupron on Monday night. I might be on the road and this time I know to bring a doctor’s note for airport security (wisdom of experience). I have put my schedule and life and online dating and pretty much everything on hold–everything is canceled except work and health-related appointments. I still need to walk in the fresh air with friends and talk on the phone so–don’t let me drop off the face of the earth. Just know that I am consolidating resources and hunkering down. And I’ll probably write a lot because, as you can tell, this is going to be quite an experience. 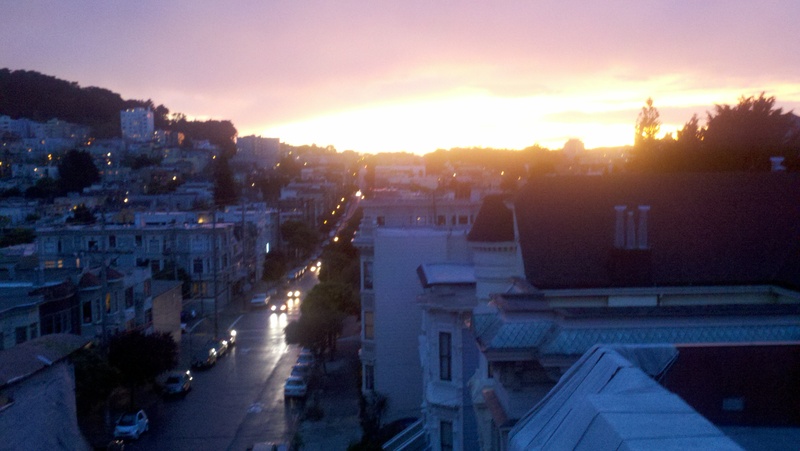 Our weekend was perfect–so fun and sweet to be living it up together in the big city. So grateful for the opportunity to celebrate our adorable mom. Postponing testing was a brilliant idea–I let it all go for one more day. I did some research and realized that progesterone delays your period, so I knew for sure that a late period didn’t mean anything promising (that and my total lack of symptoms). I was 90% sure I wasn’t pregnant. This morning I woke at 6:30, got brave, and tested. I didn’t even let myself hope for a positive, so by default I rooted for a negative. And I got it. All I wanted in that moment was to get some reassuring words from SMCs on the national forum but the server was down or something because I couldn’t get through. So I went back to bed. Sharing the news at breakfast brought on a big cry tidal wave that I couldn’t hold back (though I wanted to). Now I’m on the way out of NYC on a Greyhound bus, the sky hazy. Negative thoughts are holding a drum circle in my brain. Tired tired tired of this merry-go-round. I didn’t test today. Probably will tomorrow. Not excited about seeing two words, so today I’m just putting it on pause and enjoying the day with my family in the big, sunny city. More later. I just walked back to J’s from the office, stopping for two slices of pizza: one pepperoni and mushroom, one veggie. The pizza is always good here and rarely, if ever, gluten-free. Something was falling out of the sky that was right on the edge of rain/snow, probably hovering just above thirty-two degrees. Thousands of Knicks fans were streaming toward Madison Square Garden and I had to navigate carefully like a fish swimming upstream. I’ve been in my most typical NYC groove–staying in J’s comfy and overheated one-bedroom, walking the 7 minutes to the office, traveling up to 175th Street to see E and E and their little genius L, eating at the Venezuelan restaurant in Chelsea, running the High Line. These are the rituals. Now, I’m going to totally blast out of this routine and do everything completely differently: a touristy weekend with my family! It’s so exciting. NYC has no script for this, our family has no script for this. A true adventure. Can’t wait to blast out of this tiny corner of Manhattan and live some meaningful new family memories. It’s been a good week although emotionally up and down. I started off so together, and then upon landing I got a call from a nurse through my insurance company to say she understands I’m pregnant and I was like…no, I’m not, and she got flustered and asked if I miscarried and then apologized and said “I hate this” and hurried to get off the phone. That was seven months ago, could they update their records? Then a text that another friend got pregnant on the first try, and a careful heads up that I’d be getting an invitation to a baby shower. I believe I can be truly, unreservedly, wholeheartedly thrilled for friends’ good news and simultaneously punched in the gut–and it’s not a contradiction. The two emotions co-exist in me, and both are true. The punch is visceral…and then guilt over having a bad reaction to good news. I called my sister for consoling words and she provided them. No, the universe is not ganging up on you. It went back to being a peaceful, sunny day, and I arrived in New York feeling great. Staying centered, getting sleep. Enjoying lovely, warm greetings from friends in the NY office throughout the day. Then work stress knocked me down. I dragged myself through about 24 hours of a crisis in confidence (so many secondary and tertiary emotions–I’m mad that I’m sad that I’m frustrated etc), cried to J who gets nervous he’ll say the wrong thing, and sometimes does, but I love that he hangs in there and keeps trying. Eventually I am laughing. I ran the High Line, where I looked for and found this art installation on the side of a building, something my friend S had told me about–breathtaking. I took my morning prenatal and twice-daily progesterone. I drank water, breathed, stayed present. I felt pregnant-ish until yesterday when I really just didn’t, which added to my emotional distress. Signs of imminent menstruation. But, since yesterday, I rounded the corner on most of it–dove back into work because the only way to go is forward. Decided that IUIs didn’t work and it’s time for IVF. Decided that I create my own destiny, and it’s a big world once you force yourself out of your groove. Decided I won’t take a month off because the last time I did, I landed in the ER. I have waited 18 weeks’ worth of two week waits. I’m done waiting where there’s a choice involved. When I caught up with a friend recently, she sighed and said she didn’t think her life would turn out this way. Me neither. But why measure ourselves against an invisible and fictitious standard? Or other people? Or what other people think? This is real life, how my life turned out, sitting on J’s couch in the quiet of his apartment (he’s at dinner), with rain/snow/sleet falling gently outside on a city about to be re-discovered; pizza in my belly; gratitude, frustration, love, and longing in my heart. It’s the night before a 12-day business trip and I’m absolutely stunned by my level of organization. This seriously hasn’t happened in all my years of crazy work travel. The evidence: I’m totally packed, including 2 pregnancy tests. My clothes for tomorrow are laying out, the cereal box is out next to an empty bowl, two vitamins sitting beside it. There’s a list on an index card of what I need to remember to pack in the morning. I have a bowl of quinoa and black beans cooling next to me. I’m calling for the morning taxi. And it’s 8:16pm. Normally, I kick into packing mode around 10pm, regardless of pick-up time (which, tomorrow, is 4:30am). My last post about being in high gear was no joke–I’m so focused right now, I don’t recognize myself. I’m even getting picky (like J) about how I’m folding my clothes and setting things out either parallel or perpendicular. Let’s not get crazy now! So what is a 12-day business trip about, you ask? Basically, it’s a series of smaller trips strung together for my convenience, involving office days, meetings, visits to colleagues, four nights at J’s place, a work event, and mucho family time in between. For my Mom’s (milestone!) birthday, my sisters and I are treating her to a decadent weekend in NYC, with all three of us and my Dad! How deluxe and special that we get to share this time together. Then we’re going down to Baltimore where we’ll hang out with my two nieces! This part I just put together this morning and am feeling very gratified that I get to see them and cut out two cross-country flights.